S’mores are never out of season, and this s'mores bars recipe proves just that. With these baked bars you can get your s'mores fix without having to pitch a tent. 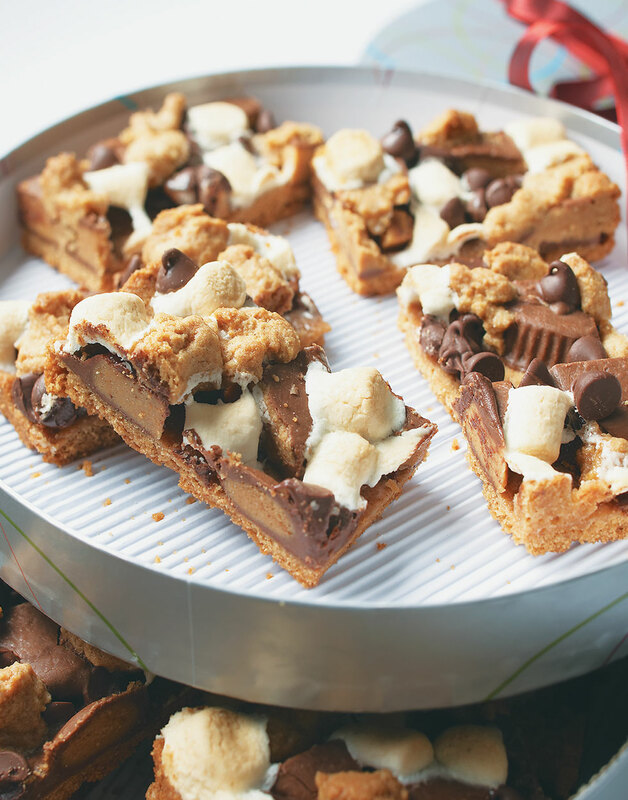 Made with peanut butter cup candy bars, this treat is undeniably addictive. If you don’t have a processor (or don’t want to haul it out), simply crush crackers in a resealable plastic bag using a rolling pin; a wine bottle works well too. Fill the bag with coarsely crumbled crackers (taking care not to overfill it), seal the bag, then carefully roll the pin over it until fine crumbs form. Preheat oven to 350°. Coat a 9x13-inch baking pan with nonstick spray. Cream butter, sugar, egg, and vanilla in a bowl with a mixer. The mixture will look curdled—it’s okay. Stir in cracker crumbs, flour, and salt. Reserve &frac23; cup of this mixture for the topping. Press remaining crumb mixture into pan (layer will be thin). Bake crust until golden around the edges, 15 minutes. Top hot crust with peanut butter cups, marshmallows, and chocolate chips; press lightly to adhere. Sprinkle reserved crumb mixture in clumps over the top and press lightly. Bake bars until marshmallows are puffed and just beginning to turn golden, 18–20 minutes. Cool bars for at least 30 minutes before cutting. To prevent the marshmallows from sticking, coat the blade of the knife with nonstick spray before and during cutting.